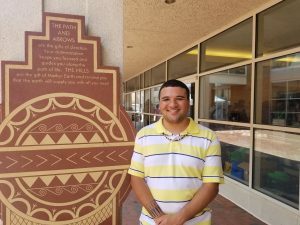 UNC junior, Blake Hite of the Cherokee Nation and Lumbee Tribe, is on the path to becoming a promising Native leader. Blake is double majoring in American Indian and Indigenous Studies and Anthropology. After graduation, he plans to obtain a PhD in Anthropology with a focus on contemporary American Indian societies. His goal is to illuminate the stories and lived experiences of present day American Indians. Blake was recently accepted into the Ronald E. McNair Scholars Program, part of the Carolina Higher Education Opportunity Program (CHEOP) Office which will provide him with programming and mentorship that will support him throughout his journey to attain a PhD. Blake remembers feeling simultaneously happy, anxious and excited when he received notification of his acceptance into the program. “I feel very excited and happy knowing that I will be able to work with other great students as we work towards our dreams”, Blake said. This semester, Blake is working as a research assistant in the Research Labs of Archaeology, where his main responsibilities are to clean and catalog artifacts that were recently excavated from the Feltus Mound, not far from Natchez, Mississippi. We at the American Indian Center are so proud of Blake. He has previously served as our Student Ambassador, Clan Leader for the Carolina Horizons Program, and volunteered at many AIC hosted events. We have no doubt that Blake will achieve both academically and professionally. He is sure to reach new personal heights.